What is all the talk about a church garden? 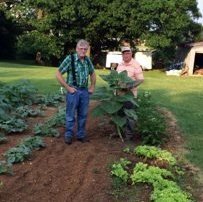 The big tilled spot behind our church office is cultivated by a group in our church that was organized by Wanda Scott to support our food pantry with fresh vegetables. 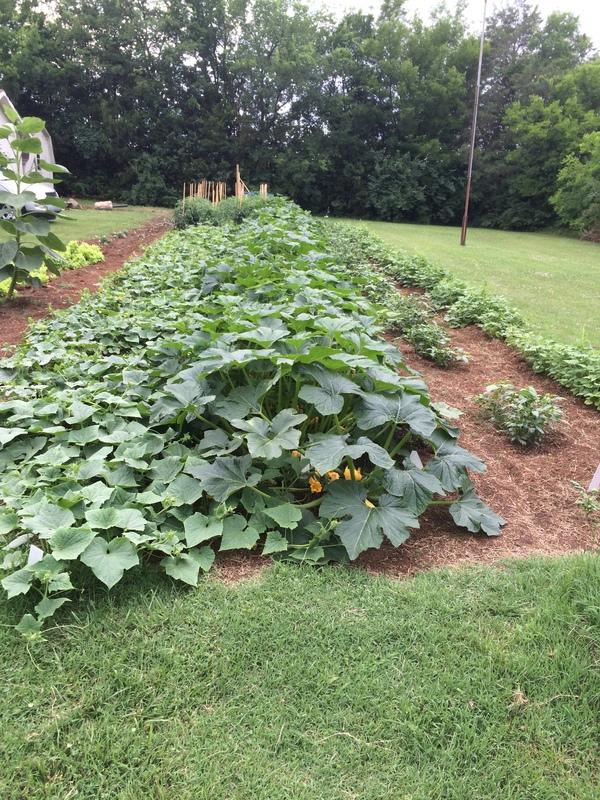 Our garden at the church is funded and staffed by volunteers of our church. The garden does not receive any funds from the church budget. Our budget is small and we have been successful because of the generous donations from some of our members. By the way, it is not too late to make a contribution that will show up on your giving statement from the church. We are still short a couple hundred dollars. The program has been operated by four core people who usually work the two days every week. We have a few others that help when they can and we are always open to others who want to get in on all the fun. Just see Billy or ET Martin. We are preparing to increase the number of people as we continue to enlarge the plot and challenge ourselves to produce more with less cost. Once the garden gets going we pick twice a week. Late Tuesday afternoon we pick for the Wednesday food pantry. We pick again on Saturday mornings for things that will spoil before the next Wednesday. Those items are offered to our church people in the welcome center on Sunday morning. We accept any kind contribution for any amount someone may want take. We know we have needy folks among our congregation. Need for any individual can come and go. Certainly if anyone needs anything and does not have any money we expect them to take whatever they want. It is there to help anyone who needs it. We use money from the donations to put back into garden fund. As with the Garden of Eden, I believe God will have his hand on our little garden as he has in past years. We have been able to produce a lot with a little and we figure to keep on. Thanks to all who have supported our mission. What about the people of Lavergne First UMC? Well, not an easy question to answer but what I often see are ordinary people doing ordinary things made extraordinary when they are made an expression of faith. There are lots of examples that I could fill pages with, however, I want to address one such thing that is going on at our church that is not known by many. Wanda Scott started our Food Pantry some years ago that has been a sustained resounding success and about the best outreach programs in our history. 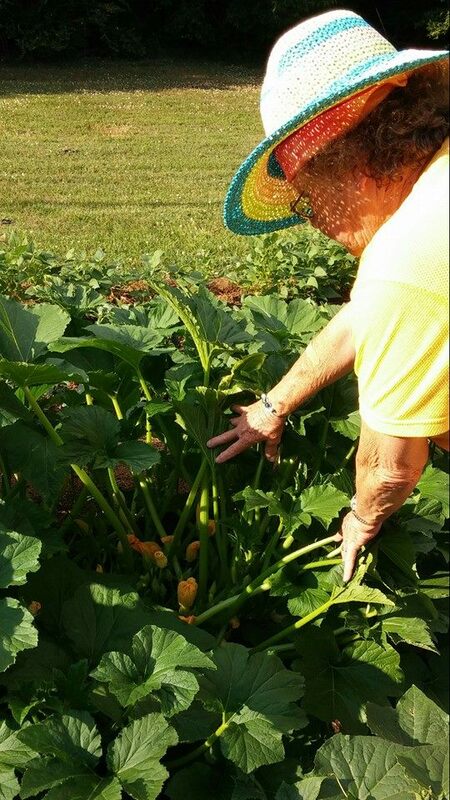 Wanda, being the Wanda we all know, gave birth to the idea of supporting the pantry program with a garden. If she could just find some people to help maybe we could produce food there at the church and lower our cost of operation while offering more to our needy. The Garden of Eden story in the bible is one of few words but conjures up images of a place of lush vegetation, flowing streams of crystal clear water pleasant enough that offers nothing but comfort, completeness and a joyful place to live. God’s intention for Adam and Eve was to live in this comfort and have a sinless life. Our world of today is far from such an idea. Even when Adam and Eve had it so well they just could not resist temptation. As we all know, in short, things got into a mess and we all have inherited the consequences of that sinful day brought to us by Adam and Eve. So, God’s plan for our redemption from this curse involved sending his own son to teach us what we should do to claim such a wonderful gift. The biblical story of the fishes and the loaves is one of my favorite stories of the bible. It is story of miracles and God meeting immediate human need. What better analogy to tie to our garden/pantry program. We take what we can pull together and turn it into enough to feed a large number of people who would otherwise go hungry. To give children in our community a backpack bag of snacks to take home every weekend so that we know they have some wholesome nourishment that would likely go unmet without our efforts. So what can I say about Lavergne First UMC and the ordinary people doing ordinary things that no matter how humble, like the boy with the fishes and the loaves, was able to feed the multitudes when Jesus placed his blessing on it. Not only are the seeds of vegetable going into to the ground important, the seeds of hope for the people we come in contact with are even more important. I invite you each to ask God to bless our humble efforts, so that our ordinary effort creates extraordinary relief of suffering and instills a sense of hope for the hungry people in our midst.